Copyright © 2012 TrueNorth Health Center, Inc. 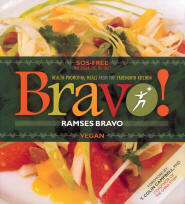 This book featuring recipes by Ramses Bravo, the executive chef at TrueNorth Health Center, is aptly titled “Bravo!” This is not only a collection of delicious, health-promoting recipes, but also contains a foreword by T. Colin Campbell, PhD, professor emeritus of nutritional biochemistry at Cornell University and a very helpful, informative introduction by Alan Goldhamer, D.C., Director of TrueNorth Health Center in Santa Rosa, California. Since the beginning of 1998, we have been publishing our own healthful vegan recipes on our web site. This is the first time that we have seen a printed book of vegan recipes that contain no sugar, oil, or salt. Bravo! is the best vegan recipe book we have seen to date. The only other thing we can say is bravo! for publishing it. We highly recommend this excellent book to everyone! Chef Ramses Bravo has created and developed exquisite vegan cuisine by combining simple flavors and textures that complement each other to perfection, without added sugar, oil, or salt (SOS). Helpful tips for using whole foods, developed to serve clients from every walk of life, are included here to make anyone’s dietary transition as easy as possible. The recipes and 14 days of menus are accompanied by analyses that document their nutritional excellence.